WELLESLEY, Mass. – Momentum is a key to any high school volleyball match. Teams build up confidence and go on scoring runs, which is amplified when that run closes out a critical fourth set and keeps a season alive. Groton-Dunstable went on that type of run in the Div. 2 Central final on Saturday afternoon at Wellesley High, winning nine of the last 11 points to pull out the fourth set 25-19 and force a decisive final set. The momentum from that run to keep the season alive, helped the Crusaders take control of the fifth and deny Canton its first sectional title since 2012. The Crusaders won the fifth set 15-7, including eight of the last nine points, to beat the Bulldogs 3-2 (20-25, 25-14, 16-25, 25-19, 15-7) and claim the Central title. Canton got off to a strong start to the match in a back-and-forth opening set. Despite dealing with the strong hitting and blocking abilities of Crusaders star Lily Blodgett, the Bulldogs were able to get into a groove with Taylor Harris and Theresa O’Brien on the outside. The five-point edge that Canton ended the set with was the largest lead for either team in the first. Groton-Dunstable answered right back with a dominant second set. Blodgett was in total control and had the Bulldogs out of sorts at the start, particularly middle hitter Erin Devine, who had a couple of hits blocked in the first and had to be creative to get good looks. “She (Blodgett) blocked her a lot, but I was proud of Erin because she scored a lot of points in different ways,” Cawley said. Devine and the Bulldogs bounced right back in the third and had their strongest set of the match. Devine got things started with a kill and then Harris added two on the outside, as Canton jumped in front 10-2. After the Crusaders cut the lead to five points, Harris again found a hole in the G-D defense for a big points and a 12-6 lead. Everything seemed to be working for the Bulldogs in the third. Olivia Chinsen and libero Megan McDonough each had an ace, Rose Hazam came off the bench and was able to scramble a ball over the net that dropped in for a point, Bailey Shea had a kill in the middle, and Liz Bickett snagged a point for Canton as well. The fourth set was also back-and-forth, as the two teams were within no more than three points of each other until the final stretch. Groton-Dunstable built an early 6-3 lead, but Canton answered right back with kills from Shea and Harris. Harris also earned a point with a block and setter Nicole Brown (who Cawley called the “glue of the team”) stepped up to the net for a block that made it 11-10. With the score tied at 16-16, the Bulldogs won the type of point that had its fans thinking the trophy was heading to Canton. After a long rally between the teams, Harris managed to dig a tough hit, Brown hustled to keep the play alive and then McDonough not only bumped the ball back across the net from outside the court but also saw it drop in for the point and the lead. G-D looked unfazed, winning the next three points to regain the advantage and force a Canton timeout. The set was closed out on back-to-back aces by Crusaders libero Peter White, who was a defensive stalwart for the Groton-Dunstable back line. The fifth and deciding set started out even, with the teams trading the first six points. After a pair of Crusaders kills, Harris stepped up and found space down the line to make it 5-4. Carolyn Mullins, who stepped up in the middle when Blodgett was on the bench, had a kill and a block to extend the lead. A kill from Shea and a mishit got Canton back within one and gave the Bulldogs hope that they could turn things around, but three straight points, including a pair of aces from White, put the Crusaders in the driver’s seat. “We hung in their in the first half of the fifth set and then we had some trouble with serve-receive and we just couldn’t get out of it,” said Cawley. Canton’s struggles with serve-receive continued down the stretch as the Crusaders won two more service points before Blodgett put an exclamation point on her night with one final kill to seal the championship. For Canton (19-3), this was an impressive bounce back year. The Bulldogs regained their spot atop the Davenport division and reached the sectional final through a complete team effort. MEDWAY, Mass. – Throughout the 2018 season, Canton senior Erin Devine and junior Taylor Harris have taken turns as the Bulldogs go-to option on offense. In fact, in 18 of the 20 matches played prior to Wednesday night’s D2 Central semifinal matchup with #5 Medway, either Devine or Harris led Canton in kills. 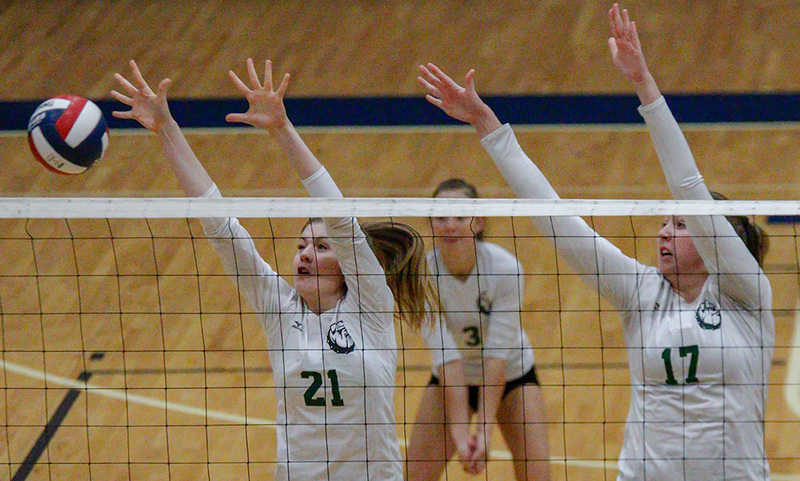 But this time around, both players had it going offensively for the top-seeded Bulldogs, each recording double-digit kills to pace Canton to a 3-1 (21-25, 25-23, 25-19, 25-9) win over the Mustangs. Devine had a team-high 16 kills (with just two hitting errors) and added seven blocks while Harris added 15 kills, 12 digs, and four blocks. It’s just the second time this season that both players reached double-digit kills in the same match. Even though Canton was the top-seed, the match took place at Medway High, which was a predetermined site by the MIAA. However, it wasn’t selected as the location until the semifinalists were set. While both players had strong games offensively, the key to the game came down to matchups. After the Mustangs took the first set, Cawley did her best to figure out how to get Devine matched up with Medway star Maegan Hladick, who had eight kills in the first game alone. Canton actually had a strong start to the first game, jumping out to a 6-2 lead but Medway worked its way back into the match and rattled off a 10-3 run to take a 12-9 lead. The Bulldogs responded with some strong play, including a couple of nice serves from Megan McDonough (12 digs), and took a 20-16 lead. But after a Medway timeout, the Mustangs won five of the next six points to tie the first set 21-21. Despite a timeout from Canton, Medway won the next four points, including a pair of kills from Hladick, to secure a 25-21 victory to go up 1-0. Cawley elected to try and get Devine and senior Bailey Shea on the opposite side of the net to try and get a block on Hladick. “We didn’t change after the first game but we matched up better because they changed their rotation,” Cawley said. “When they started with the serve, they changed it and it was a better matchup for us. Going into the third, I had a feeling he was going to switch his rotation so I moved mine and luckily we matched up. We were lucky with the rotation, it’s a lot of guess work. The matchup change worked well for the Bulldogs, as Hladick finished with just four kills in the second set. While Canton led for the majority of the match — going up 12-6 after a big kill from Devine, and 16-10 off the hand of Devine again — Medway continued to battle back. The Mustangs got within three 18-15, and then notched four straight points to go up 19-18 to force another Bulldog timeout. Canton came out with renewed energy, but the Bulldogs trailed 22-21. Devine landed a kill to tie it, a strong serve from Julia Minichiello resulted in a 23-22 lead, and Devine landed a big block on Hladick for a 24-22 lead. Medway got within one but saw its final hit go into the net with Devine and Shea ready for the block. The third set was close throughout, with nine ties in the first 26 points, the last coming at 13-13. But Devine landed a kill and blocked an attack, and Harris landed back-to-back kills for a 17-13 lead. Canton kept the lead the rest of the way, but Medway did get close at 19-18, but before the Mustangs could tie it, Cawley called a timeout. Coming out of the timeout, Canton won six of the final seven points, getting a kill and an ace from Harris in the span to win 25-19 and take a 2-1 lead in the match. Harris finished with eight kills, a block, and an ace in the third game. The momentum from the win in the third set carried over into the fourth set. Devine landed a kill and had a block, Shea, Rose Hazam, and Nicole Brown (28 assists, 11 digs, six kills) all had a kill, and Harris added two kills as Canton raced out to a 12-2 lead. The strong beginning was all Canton needed as the Bulldogs went on to win the fourth set 25-9 to secure a 3-1 victory. Canton volleyball (19-2) advances to the D2 Central Final and will play the winner of #2 Groton-Dunstable (18-2) and Westboro (17-3) on Saturday at Wellesley with a time to be determined. It marks the fifth time in the last seven years that Canton has reached the sectional final. #5 Mansfield, 5 @ #4 Bridgewater-Raynham, 0 – Final – Mansfield got goals from five different players to win on the road and reach the sectional semifinal. Katie Garvin, Bryn Anderson, Sydney Mulkern, Cassidy McMahon, and Sarah Sacco each tallied goals for the Hornets. Steph Kemp had a pair of assists, while Emily Viegant, Cathryn Cooney, and Anderson each had one assist. Vigeant and her center back partner Mikaela Maughn led the way for the Mansfield defense, which held onto a clean sheet. #3 King Philip, 4 vs. #11 Barnstable, 0 – Final – Click here for a recap and photo gallery of this game. #13 Franklin, 3 @ #5 Plymouth North, 2 – Final – Franklin scored the first three goals of the game and then held off a comeback attempt from Plymouth North to earn the win on the road. The Panthers seized the lead at the 10th minute when Regan Paterson scored off an assist from Amanda Lewandowski. Sara Carney made it 2-0 just over a minute before halftime with Cassi Ronan and Paterson earning assists. Franklin added to its lead 10 minutes into the second half when Carney set up Lewandowski to make it 3-0. Plymouth North got on the board just two minutes later, and made it a one-goal game with 10 minutes to play but Christina Luccini didn’t allow the hosts to tie the game. Franklin advances to the semifinal to face top seed Walpole on Thursday at Taunton High. 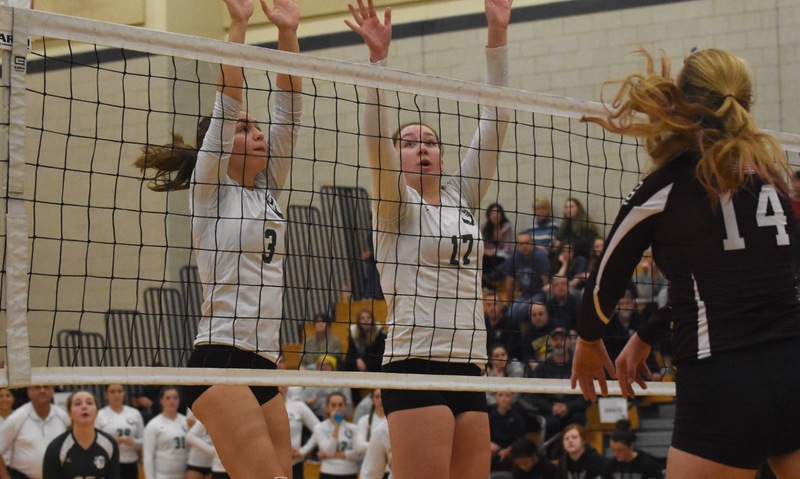 #9 King Philip, 0 @ #1 Newton North, 3 – Final – King Philip saw its 2018 campaign come to a close at the hands of top-seeded Newton North, falling 3-0 (10-25, 9-25, 19-25). Catherine Waldeck and Nicole Coughlan (two blocks) each recorded four kills while Shayla Weitzman and Lily Carlow (ace) each recorded six digs. #2 Stoughton, 3 vs. #10 Middleboro, 0 – Final – Click here for a Recap and Photo Gallery from this match. #1 Canton, 3 vs. #8 Holliston, 0 – Final – Canton shined defensively and got contributions from a handful of players at the net to open the state tournament in style with a 3-0 win (25-9, 25-11, 25-16). “We played a strong match from start to finish,” said Canton head coach Pat Cawley. The offense was spread around to all the hitters with Taylor Harris leading the way with 10 kills. Erin Devine, Liz Bickett, Theresa O’Brien and Rose Hazam all played well. The strong defensive play was anchored by Megan McDonough, Julia Minichiello and Olivia Chinsen. Nicole Brown ran the offense with precision, with 24 assists, 10 digs, four kills, and two aces. Top-seeded Canton advances to the D2 Central Semifinal to play #5 Medway. Mansfield @ Dartmouth – Postponed to Tuesday, 10/30 at 4:00. Milford @ Stoughton – Postponed to Tuesday, 10/30 at 4:00. Taunton, 0 @ Oliver Ames, 2 – Final – Oliver Ames scored once in each half to earn a win in its final regular season game. Sophomore Colin Milliken had a goal and an assist for Oliver Ames, scoring in the first half on an assist from Haendal Louhis and then setting up Kevin Louhis for an insurance goal in the second half. Mansfield, 0 vs. Natick, 0 – Final – Lauren Whitman made three saves on Natick breakaways in the first half and combined with Caty DeMassi to record the Hornets’ 13th clean sheet of the season. King Philip, 2 vs. Walpole, 0 – Final – Avery Snead scored once in each half to give KP a win in the regular season finale. Both goals were assisted by Ally Stanton, with Chloe Layne also getting credit for an assist on the second half goal. Taylor Butler made six saves to keep the clean sheet and the Warriors defense had another good night to keep the Rebels off the board. Canton, 3 vs. Westwood, 0 – Final – Canton concluded its regular season with a 3-0 win over visiting Westwood (25-19, 25-15, 25-14). Liz Bickett and Erin Devine controlled the middle with 17 kills, Taylor Harris had 11 kills and 11 digs, Megan McDonough was solid on defense with 17 digs, and Nicole Brown continued to run the court with 25 assists, one kill, and an ace. Mansfield, 1 @ Holliston, 3 – Final – Mansfield suffered a setback in its final game of the 2018 season, losing 1-3 (31-33, 11-25, 25-20, 19-25). Greenly Kelly and Emily Dardinski had nine kills apiece while Olivia McGrath had 12 kills to pace the Hornet offense. Julia Kelly finished with 18 service points.